Oscar-winning designer and artist Alan Lee has something to celebrate this week after finally putting the finishing touches to the illustrations for J R R Tolkien's The Children of Húrin, the first complete book by the author since the posthumous Silmarillion in 1977. 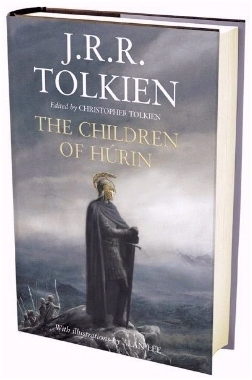 The Children of Húrin, due for worldwide release on Tuesday 17th April, and published in the UK by HarperCollins Publishers, was begun in 1918 and was one of three 'Great Tales' J R R Tolkien worked on throughout his life but which remained unpublished. Now Christopher Tolkien, the author's son, has painstakingly edited together the complete work from his father's many drafts, and it represents the culmination of a tireless thirty-year endeavour to bring J.R.R. Tolkien's vast body of unpublished work to a wide audience. The Children of Húrin by J R R Tolkien, and edited by Christopher Tolkien, will be simultaneously published in two editions - a standard hardback edition at £18.99 (ISBN 0-00-724622-6) and a deluxe slipcased edition at £60.00 (ISBN 0-00-725223-4). The Children of Húrin at amazon.co.uk.